The new base game, Hexâ€¢Hex XL, includes all of Hex Hex 1.5 as well as the best of Hex Hex Next --PLUS 2 ALL NEW play variants and bits to go with 'em that add a lot of excitement to game play. The variant Hex Hex Vexed includes 25 new 'law' cards and 12 new tokens -- and is perfect for a one-game sitting, where you want to see a few classic HEXâ€¢HEX â€˜Lawsâ€™ come into play DURING play. Each Hex cast becomes a specific type of Hex â€“ that delivers a curse upon all the players who become Hexed that hand. The other variant, Hexen Stix, adds a lightning-fast reflex element to game play â€“ a ring of hexagonal shaped obelisks that mete out penalties for those who do not rise to the challenge quickly enough in grabbing them and can reward those who do. Fast and fun. This game is all about non-stop player interaction. Every card you play is an attack or a back-stabbing tactic. A good amount of the rules are right on the cards so there's a small learning curve (one game ought to do it). After that, it is pretty simple to play. Heck, even your non-gamer friends will enjoy it. A single hand lasts from 3-5 minutes. A game from 20-30 minutes. But more often than not, groups play sessions running 3-5 games long as players create new and different ways to be â€˜meanâ€™ to each other. (check our list of favorites) It's no strategy game. But if you're looking for a great 'beer & pretzels' style game with a fun mean-streak. This is it. A game of "evil hot potato" where players try not to be the one left holding the Hex. 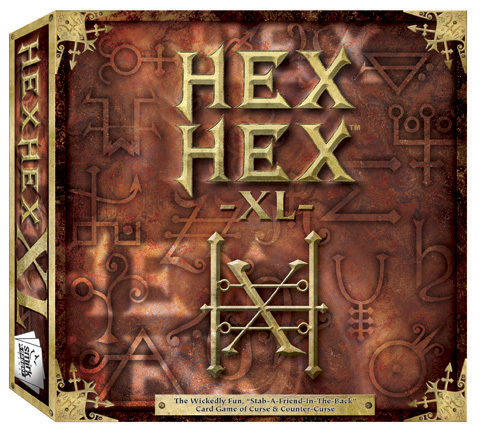 XL version has expanded components, includes cards from the former expansions, and a new way to play with Hexen sticks that will add dexterity to your curse flingin' ways. Definitely a fun party game.